Converting website visitors is so tricky, isn’t it? On the one hand, you feel it’s best to engage people while they’re viewing your site. On the other, everyone around you says that grabbing a visitor’s attention when they’ve decided to leave works better. And yet, the fact is that exit popups deliver much stronger results than the “traditional” conversion strategies. Companies targeting the exit intent typically engage around 7% of their visitors. Those focusing on visitors still browsing the site, however, convert only about 0.5% to 2% of them. But how do you launch an exit popup capable of delivering such results? What’s the secret to engaging visitors who are about to leave your site? And how do you turn them into leads and customers? That’s what you’re going to find out from this guide. You’ll learn everything about exit popups and the exit intent technology. You’ll also see examples of popups that have worked exceptionally well for their creators. And I’ll show you how to build a high converting popup too. What is the exit intent technology and why it engages so many visitors? What types of exit popups could you create (with examples)? 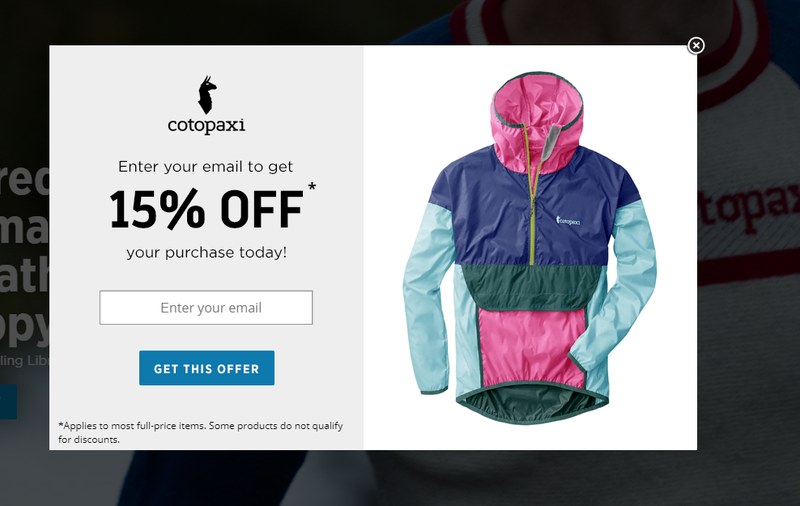 What factors make a successful exit intent popup? How to make your first popup a success? 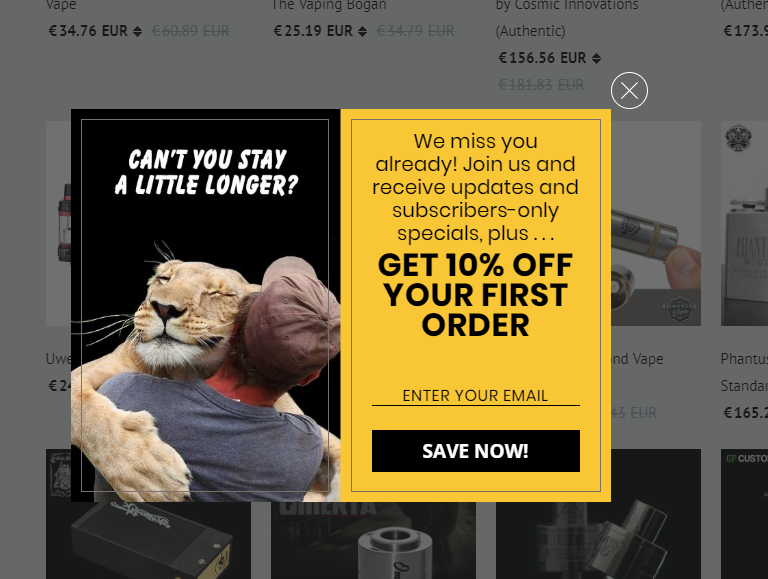 How to launch exit popups that target mobile users? An exit popup is a marketing message displayed to a website visitor who’s just about to leave. Marketers use exit popups for a variety of reasons, from converting a person to an email list, convincing to complete their purchase to deterring them from leaving and more. How Does an Exit Popup Work? How does it know when someone is about to leave the site? Click the browser’s Back button and return to another page. Since doing any of the above would result in them leaving the site, the exit intent script triggers a popup to appear. But how come displaying a message to a leaving visitor works so well? Logically, they should ignore it and move on, after all. And that’d be true, except for one little detail – the “pattern interrupt” technique this strategy uses. 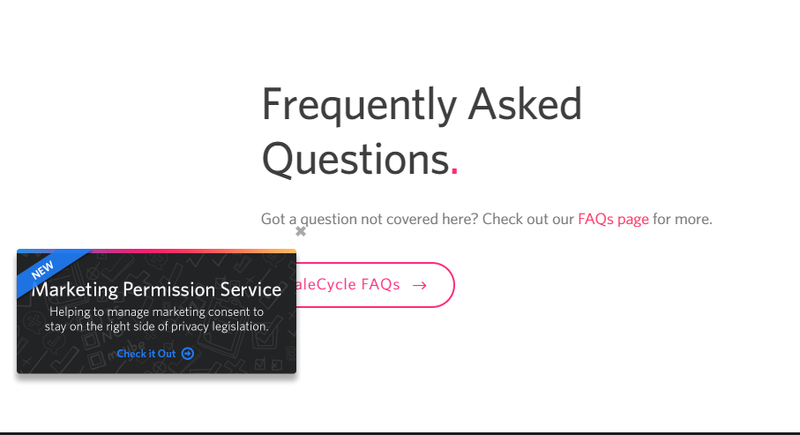 An exit popup interrupting a person’s action to leave the site makes them more likely to stop and consider the message. Contrast that with the way traditional lead generation strategies work, relying on a person to notice the message, and you’ll see why popups deliver much stronger results. They don’t interrupt a person’s experience on the site. Exit popups don’t barge in when a person reads your content or impede any other action they make. A visitor sees them only when they’ve decided to leave. Granted, the Exit technology will interrupt them then. But I’m sure we could assume that, by then, the person has, most likely, finished engaging with your content. What online marketing goals exit popups help achieve? 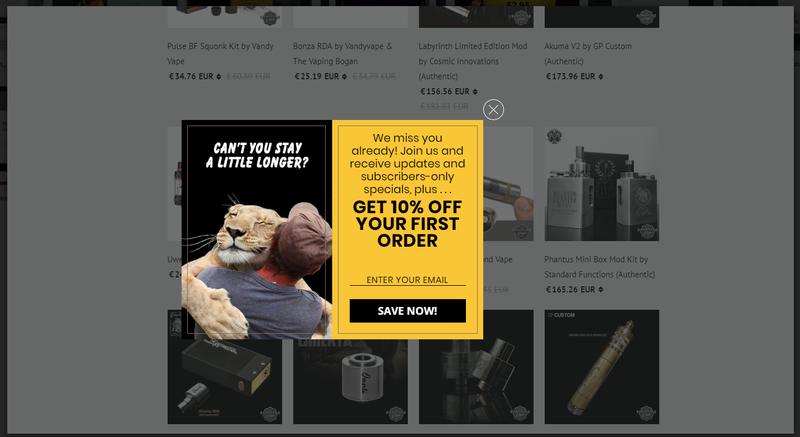 Examples and use cases for exit popups. Stopping a person’s who’s about to exit your site should not be the ultimate goal of a popup. As you’ve already seen, you target that action only because of the incredible opportunity to engage a visitor it offers. However, your true goal behind displaying that popup would be different. Below, I’ve listed some of the most common uses for exit popups. I’ve also included examples to illustrate how various companies have used them to achieve those goals successfully. I couldn’t believe it myself at first too. However, the research we conducted in 2017 proved it clearly – Exit popups collect 5% more emails, on average, compared with messages displayed when a visitor lands on the site. Part of the reason could be that, by the time someone decides to leave, they’ve already engaged with your brand and the message. As a result, they’re more likely to want to continue the conversation. And joining the email list is a good way to do so in a low-key way. Organic aromas boosted email signups by 150% with an exit popup. And Backlinko doubled his email opt-ins with this strategy. 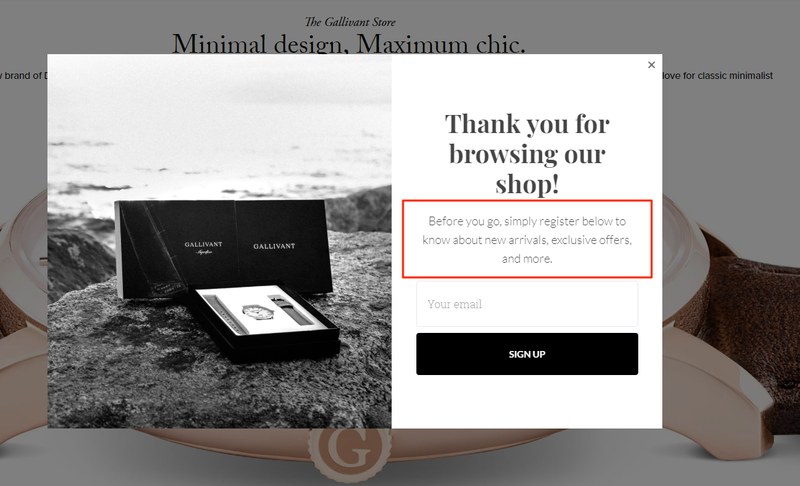 Leesa.com and Gallivant use simple offers to entice a visitor to join their mailing lists before they go. What’s the best way to retain a person on the site for longer? To entice them to engage with your content more, perhaps in the hope of them finding out about your product or converting in any other way? The answer – Suggest additional content that they might want to read. Use the exit popup to tell visitors about your podcast, suggest other articles on the site or point them to any other content asset you think they would find intriguing. 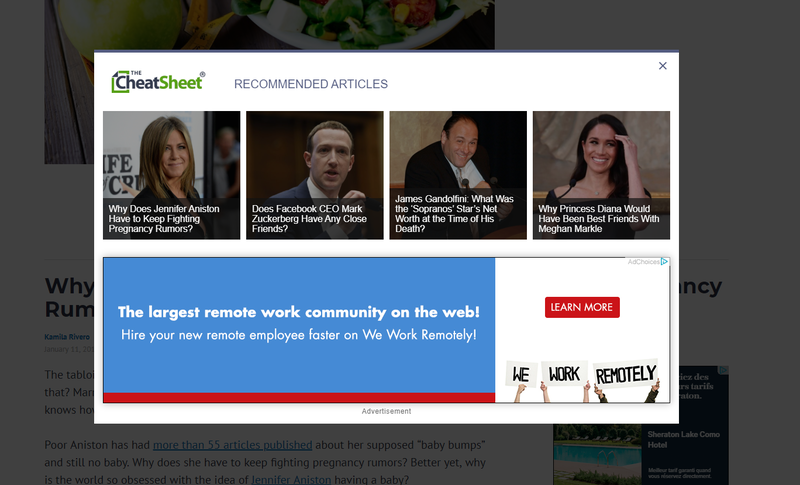 CheatSheet.com gives the exiting visitor a whole bunch of content to read. Drip uses the strategy to promote Au+oma+ed, their series of talks on e-commerce marketing and strategy. Many B2B companies create lead magnets – white papers, eBooks, a content upgrade or checklists – that correspond to their target audience’s interests and the stage in the buying cycle. But there’s a catch: A person can receive the lead magnet in exchange for their contact details and joining the company’s email list. And many companies use exit popups to tell their visitors about the lead magnet. 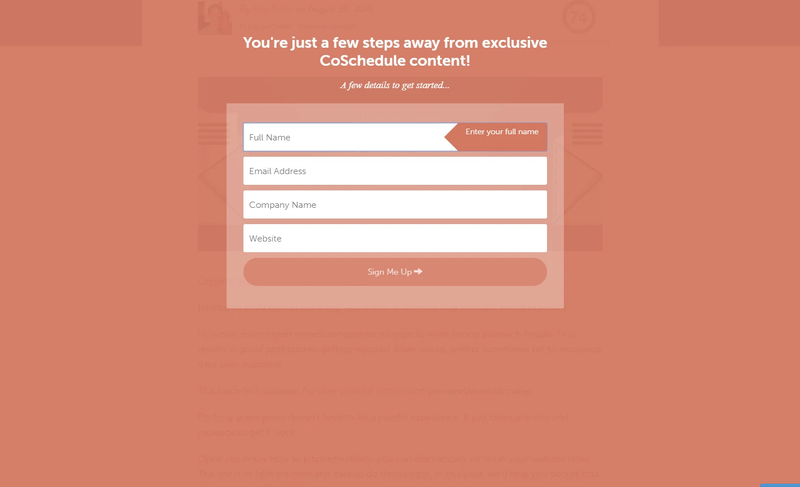 CoSchedule, for example, uses a full-screen overlay to promote exclusive content. 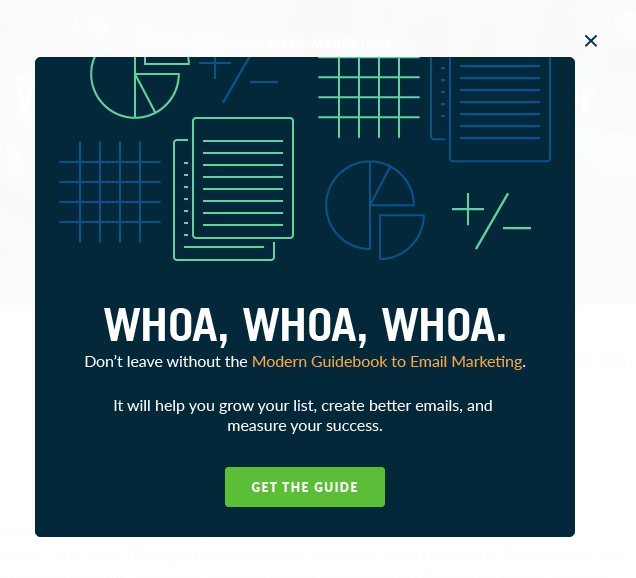 With exit-intent popups, Campaign Monitor promote their Modern Guidebook to Email Marketing. 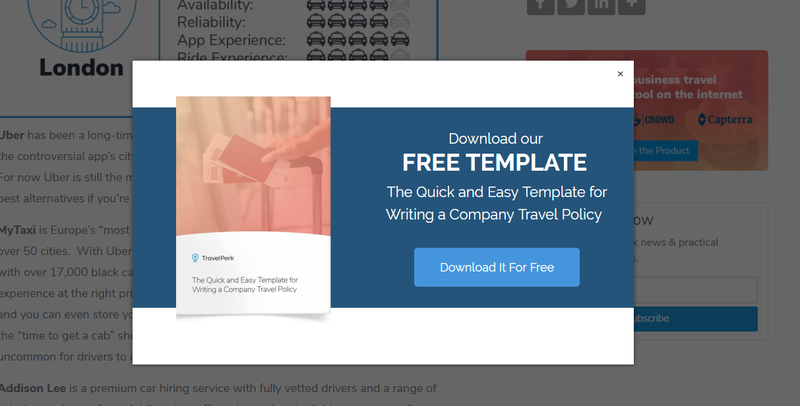 And an exit popup helps Travel Perk drive more downloads of their Template for Writing Company Travel Policy. The shopping cart abandonment rate may have dropped a little in recent years. That said, it continues to be one of the most severe challenges online stores face daily. Many of them turn to exit popups to help retain at least some of those abandoned purchases. 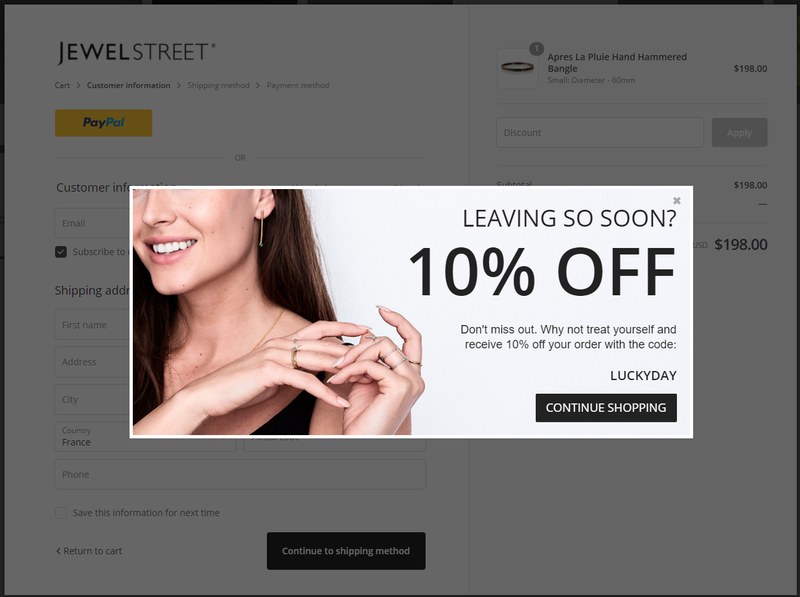 JewelStreet, for example, offers a 10% discount to any visitor who’s about to exit from the cart or checkout pages. GlobeIn encourages them to complete the purchase by offering a free shipping code. But they display it only to customers who are about to abandon their cart. Laura Ashley uses an alternative approach. 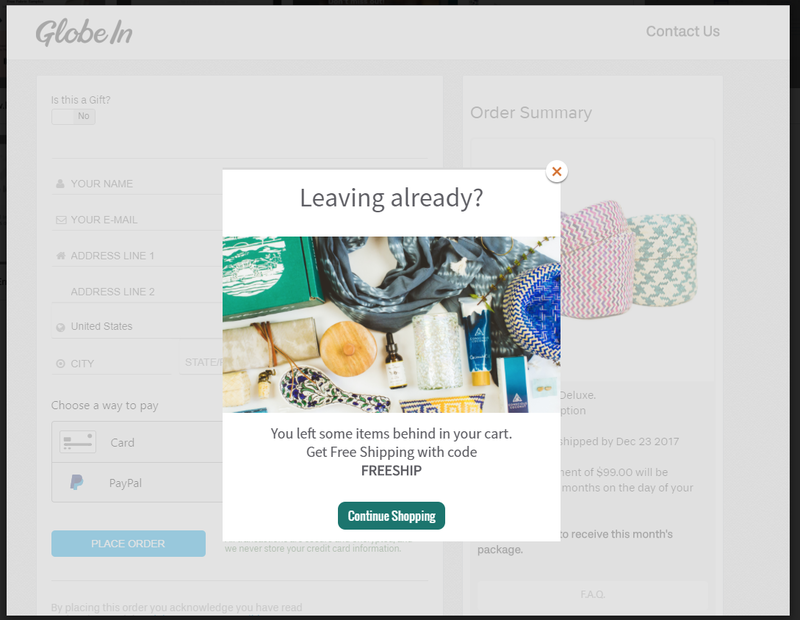 The company’s exit popup offers a visitor a way to save their cart for later, allowing them to complete the purchase whenever they are ready. 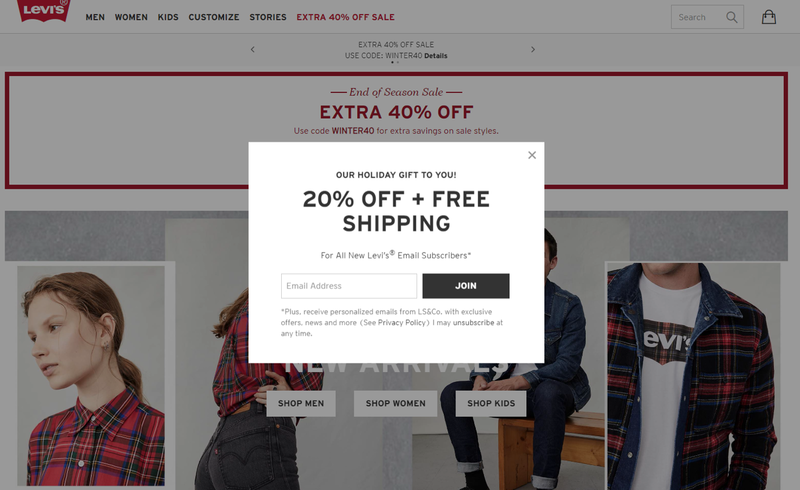 Exit popups help online retailers convince leaving visitors to add products to their carts too. Offering coupons, special deals or communicating the sense of urgency may entice a person not only to rethink their idea to leave but start the buying process. Here are two examples showing how companies appeal to those visitors and convince them to stay. Roadside Vapes offers a first order coupon. PureVPN, on the other hand, uses a time-sensitive offer to push a visitor into action. Finally, engaging someone on their way out of your site is an opportunity to get unbiased, honest feedback. They have browsed through your site, after all. They’ve read your message and learned your positioning. And most likely, they’ve made up their mind about you already. 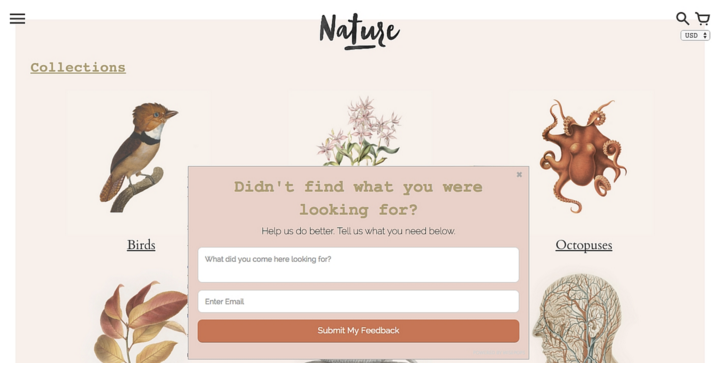 Nature, for example, asks leaving visitors about the information they missed on the site. Figuring out what marketing objective you want to reach, helps you gain clarity as to the type of popup you want to create. But you can only do it by knowing what popup elements to include and how each contributes to the campaign’s success first. So, let’s talk about that now then. Do something for me, please. Before we continue further, scroll up the page for a moment. Look at the popup examples I’ve shared with you there. Can you spot any similarities between them? I bet you can see plenty. They all include similar elements, in fact, right? Each has a headline. Sure, it can take different formats, but it’s there. Every popup promises something to the visitor too. Some feature additional copy explaining that promise. Others don’t. But they always indicate what the person would get. Many have a button to click or a form to fill in. And you can see an image on most exit popups as well. 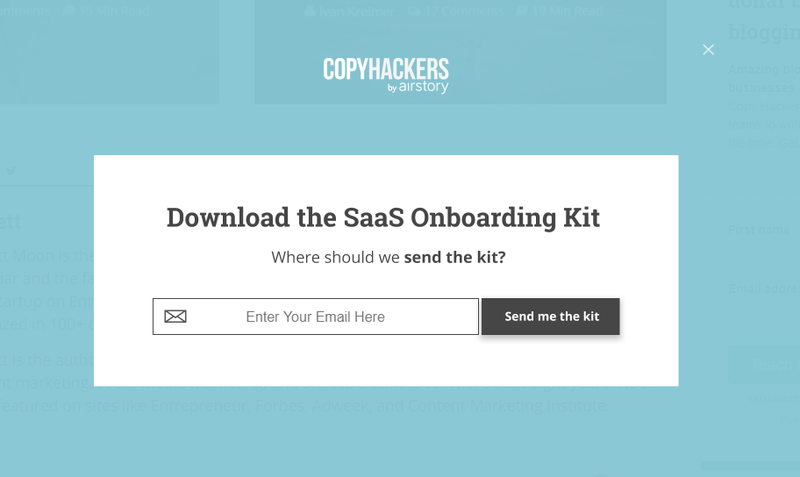 An exit popup must include several critical elements to succeed. In this section, we’ll go through each of them in detail. I’ll explain what those elements do, how they engage a visitor, and also, what are the best practices for creating them. A quick note before we begin: My goal for this section is to offer you a guideline for creating your exit popups. 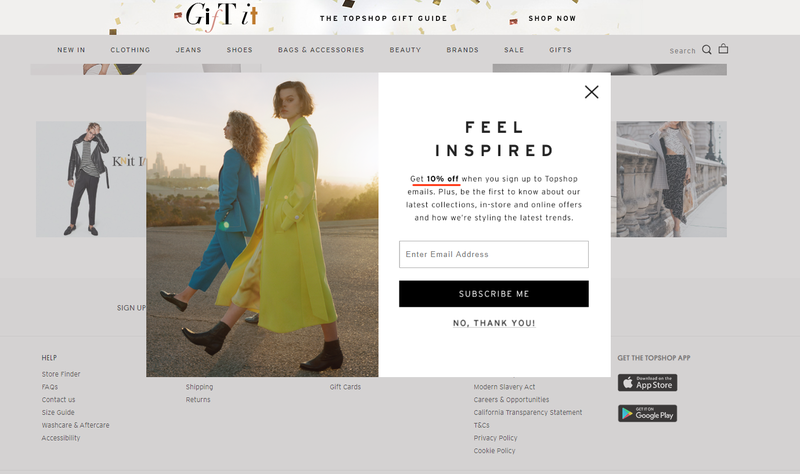 Use this information to identify what to include on the popup but also, where and how to use each element to help increase conversions. Do you want to know the biggest secret of exit popup success? 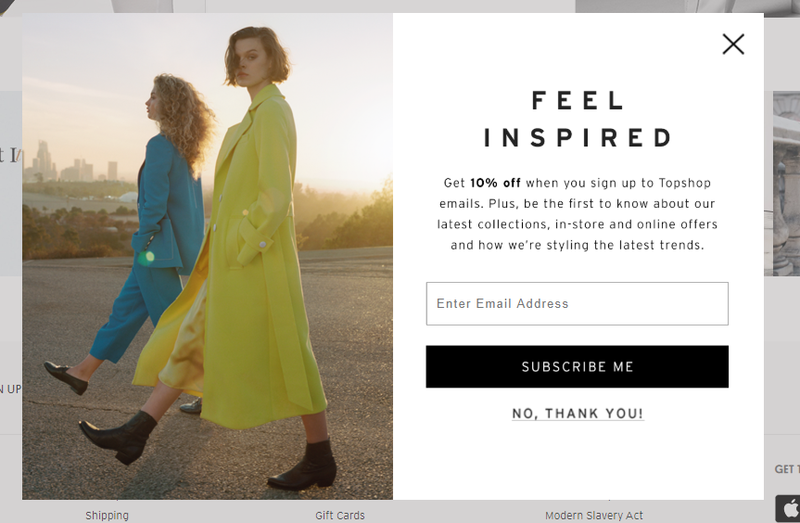 It’s offering a visitor something they’d be willing to act on your popup – Give you their email address, go to a specific page, complete the purchase. We refer to this element as the pop-up offer. And the simplest way to describe it is as something you promise to give the person if they act on the popup call to action. You can promise them a discount code, if they give you their email address in return, for example. Or promise to send them your latest articles. You could entice them to join your mailing list by making them the first people to know about new products, promotions or deals. And that they’ll be able to avail of them far before the general public. You can try convincing them to buy the item they’ve added to the cart with a generous one-time offer. Or deliver the information they sought, in the form of a free downloadable resource, for their email. All in all, the offer you choose must match two objectives. One, it has to relate to your marketing objective. For example, if you aim to build the mailing list, you must offer something a person would want to give their email address for. And two, it must meet the audience’s needs. Think about it, if your audience doesn’t seek in-depth information, then offering a lead magnet will, most likely, fail to deliver significant results. But if they’re in a shopping frenzy and you promise to send them a discount code, then you can count on many signups. How do you communicate the offer? Most commonly, you include it in the headline. However, placing it in the sub-copy or even the call to action would tell the person what’s in it for them equally well. 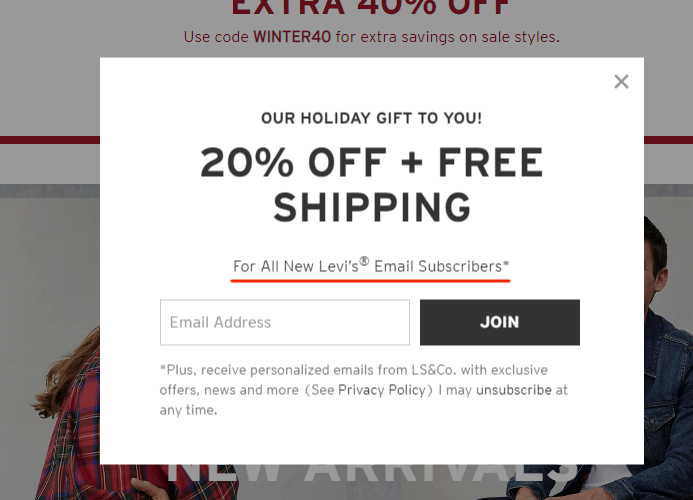 Levi’s, for example, uses the headline to reveal the offer – A discount and free shipping. GiftIt, on the other hand, locates the offer in the sub-copy. However, note that they’ve set the key information – the size of the discount – in bold. In doing so, they make it visible clearly, in spite of it not being in the headline. Of all the popup elements, the headline is the most important one. First, it attracts the visitor’s attention. Without a strong headline, the person will, most likely, click the popup off and leave in a hurry. On most popups, the headline also conveys the offer. It tells the visitor what’s in it for them. And that’s another way it attracts their attention too. Finally, the headline makes them review what else is on the popup, discover the offer and act on it. I’m sure you’ll agree, neither of the above is a small feat. But your headline has to do them all. The good news? You don’t have to start from scratch. Use proven formulas to write headlines that will engage your users. We’ve described them in detail with examples in another guide. You can view it here. Let me be clear here; you don’t have to include the description on the popup. Often, the headline alone can tell a visitor everything about the offer while the call to action entices them to act. Here’s an example from CopyHackers showing exactly that scenario. This headline from Cotopaxi also explains everything about the offer. The call to action, on the other hand, tells the person what to do. But at times, you may want to include additional information. Perhaps you need to include more selling points to convert a visitor. Or you have to mention the terms and conditions of the offer. That’s where a description comes in. Such short copy allows you to extend the information about the offer beyond the headline to convince a person to act. Gallivant uses the description to engage a visitor and communicate their offer. Levi’s uses it to communicate the offer’s T&C’s. 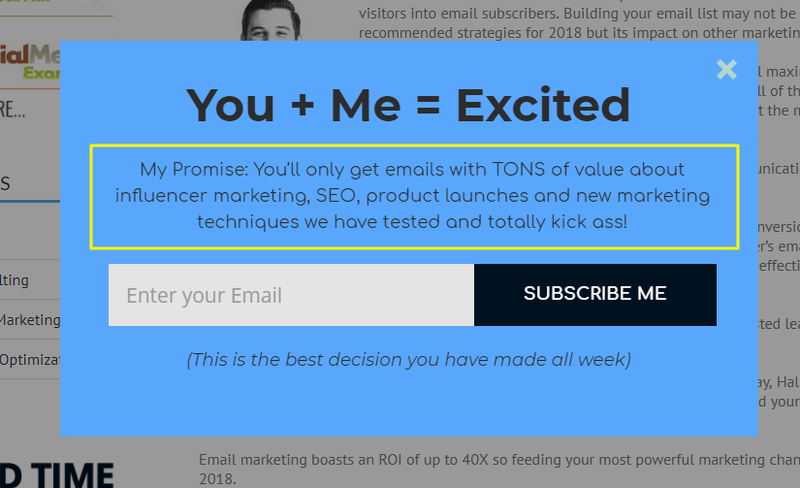 Shane Barker, on the other hand, included the complete value proposition to convince a visitor to join his newsletter. All in all, you don’t have to include the description on a popup. However, I recommend you do when you need to present more information to the visitor. Your popup does not require any visuals to engage visitors successfully. However, studies show that including graphics helps grab a person’s attention and convince them to act. In some cases, images can also help increase conversions. For one, we process visual information quicker than text. A strong visual, therefore, can help communicate the message faster than a lengthy sub-copy. The example below illustrates it pretty well. Images also help direct the user’s attention to the most important elements of the popup. Look at the below example. Did you naturally gaze at what the person on this popup is pointing at? I’m sure you did. However, you have to be careful when choosing the right popup images. Irrelevant visuals might deter a person from reading the headline or the description. For example, models on the popup below walk away from the headline. Most visitors’ gaze would follow their track, moving away from the most important message on the exit popup. Use images of people to make your popup more trustworthy. If possible, choose images of people looking or pointing towards the headline or call to action. Otherwise, show products in use to help visitors imagine how it would be to own them too. The majority of popups display at the center of the screen. Most examples I included in this guide place their message in that location too. But that’s not the only place where you could display the popup. You can locate it in any corner of the screen, use the top or the bottom edge of the browser’s window or place it on either side. Finally, you could cover the entire screen with the popup overlay. Furless uses the full-screen overlay to ensure visitors don’t miss the offer. Salecycle, on the other hand, display their message at the bottom corner of the screen. But why would you choose a different placement? Because, at times, using it could yield even better results. First, unusual placement might surprise a visitor. The popup would not only interrupt the person’s pattern of behavior but also, surprise them. Studies have proved that we tend to pay close attention to things that surprise us. By placing the popup in an unusual spot of the screen, you can use both, the pattern interrupt and the power of surprise to engage a visitor more effectively. The call to action, in turn, closes the process. It tells a person what to do to get the offer and how to do it. For that reason, most exit popup calls to action feature an active verb relating to the action a person must take. From a simple “Submit” or “Sign up now” to a copy more relevant to the offer – “Get the $10 coupon now” – the button intends to spur action. Many rules and best practices exist to help write engaging calls to action. Of them all, I believe, simplicity is the most important one. As long as you keep the call to action short, simple and focusing on the task you want the person to do, it will aid in achieving your marketing objectives. 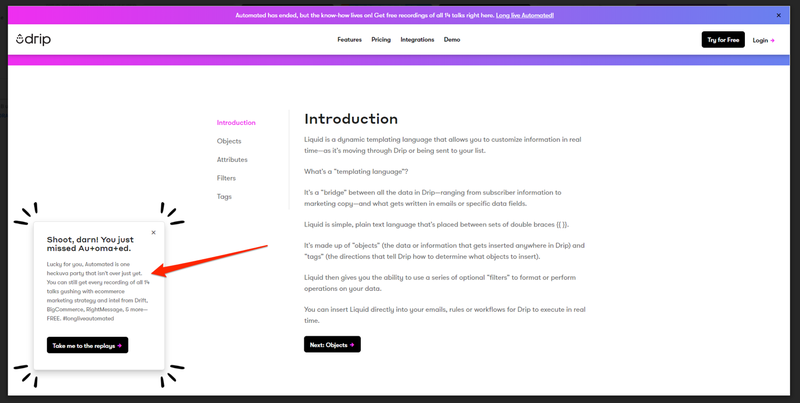 For inspiration, see the example popups I included in this guide. Most feature a single-word call to action; some include two or three. But rarely you see a popup with a copy longer than a handful of words. By now, we covered all the elements to include on an exit popup. There is, however, one more issue we need to discuss – Displaying exit popups on smartphones. Because, as I’m sure you agree, there is a problem with that. Smartphones lack cursor or mouse. But, as you already know, identifying the exit intent proves impossible without being able to track the cursor movement. At the same time, with the rise of the mobile traffic – currently at 52%, and growing – you, most likely, don’t want to lose out on the opportunity to engage those visitors too. Luckily, I have a solution. Upon reaching close to the end of the page, they either tap to open tabs or begin scrolling up to reveal the back button or the URL address bar. As a result, we can estimate that when a person begins to scroll up, they might be considering leaving. It’s a behavior we can track and use to establish a potential exit intent! I admit that the above method isn’t as effective as the desktop intent tracking. However, it still offers the opportunity to engage mobile visitors about to leave the site, retain them and convert to leads. Want to launch a test exit popup? 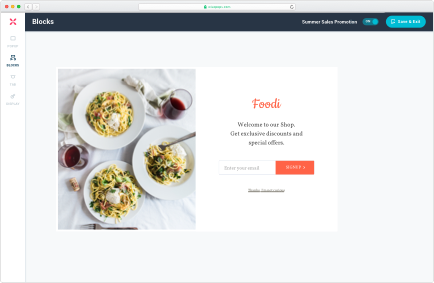 Check out our simple popup builder now.